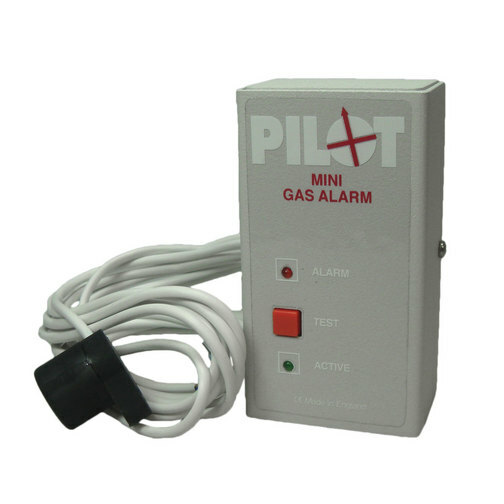 A 12 volt mini gas alarm with a single sensor that can detect a potentially serious gas leak and warn you with an audible alarm and visual red light. This 12 volt Pilot mini gas alarm with a single sensor can detect a potentially serious gas leak and warn you with an audible alarm and visual red light. This gas alarm detects propane and butane gas amongst other potentially dangerous vapours. With an easy operation, single button control, you can install this boat gas alarm onboard as a safety precaution. The gas alarm can be installed into an inconspicuous location and the gas leak sensor can be installed up to 3.5m away from the alarm itself with the included cable. This gas alarm is designed to run continuously and therefore does not have a traditional on/off switch, rather it runs directly from you onboard power. It is designed to be permanently on so that if a gas leak was to appear it can detect it whilst you are onboard. The integral fault detection circuit warns of low power supply, sensor failure, sensor or power disconnection and a circuit shortage. Importantly, this gas alarm is fitted with a 'Test' button which allows you to be sure that the alarm is working correctly. By pressing the 'Test' button the alarm stimulates the presence of gas and the alarm should sound immediately.